Here Comes the Bride! Paying homage to one of the world's most famed wedding sayings; our "Here Comes the Bride" custom wedding banner is super fun and a unique way to announce the bride's arrival! 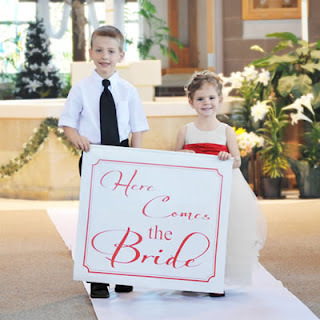 As an alternative to the traditional roles of flower girl and ring bearer, the banner is typically carried down the aisle by children right before the bridal march, this ultra enjoyable banner will give all your guests one more reason to turn their heads in excitement! Available in 12 colors. A beautiful alternative to the traditional unity candle, our Unity Sand Ceremony Shadow Box Set creates a sentimentally chic way to display your love. Perfect for outdoor ceremonies or destination weddings, this keepsake kit includes everything you'll need to create a memorable unity ceremony as well as provide your home wit a unique piece of decorative home decor after!! Simply display your finished sand artwork and use your pouring vases for candles, flowers, or whatever else you see fit, and you see just how amazing a symbolic centerpiece can be. Our Personalized Rhinestone Toggle Bracelet is absolutely darling!! Perfect for the bride AND the bridesmaids. This rhodium finished bracelet featuring a circular rhinestone toggle charm is an excellent gift for all the women on your list. Whether you're dressing up or dressing down, this sparkling bracelet will look fabulous with all your clothing options. Includes a free organza gift pouch. Our Wedding Pen Wedding Favor with four rotating messages allows you to convey the excitement of your new life together and gives your guests a unique keepsake wedding favor. Use one of our verse ideas or make your own!! Mix and Match Culturally Diverse Cake Toppers!!! Now your cake decorations can be as personal and as special as you are. These fashionable and culturally diverse Brides and Grooms stand poised to embrace!! Mix and match the partners to create a custom figurine that reflects your unique blend. 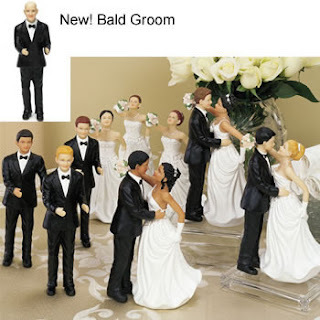 Set includes 1 each, bride and groom 7" tall. It's your day...personalize it!!! WhereBridesGo.com offers many fun ideas to help you create your perfect personalized wedding. Gorgeous! Love this wedding! what a beautiful bride!